Would you like to know how your print will perform before you mail? Traditional testing takes time and is expensive. With this solution, our customers can predict which combination of format, offer, message and imagery will be most effective in print campaigns. Accelerated Insights uses a unique combination of demographics with the cultural and emotional factors that affect decision making to pinpoint how to motivate targeted consumers. Using an on-line survey panel, rapidly test consumer response to an almost endless combination of variables before sending out a single piece of mail. With a proprietary algorithm, Accelerated Insights predicts which combination of information works best. With no waiting for mailing and actual responses, cuts total testing time by 75% . Get better, more reliable results much faster than ever. Finally, we have a testing platform that doesn’t require so much time and calculation, yet still gets us the information we need to develop productive mail packages. Marketers have been following the same direct mail testing protocols for decades. Accelerated Insights digs deeper. It combines demographics with the cultural and emotional factors that affect decision making. Its sophisticated persona matrix pinpoints how to motivate consumers. 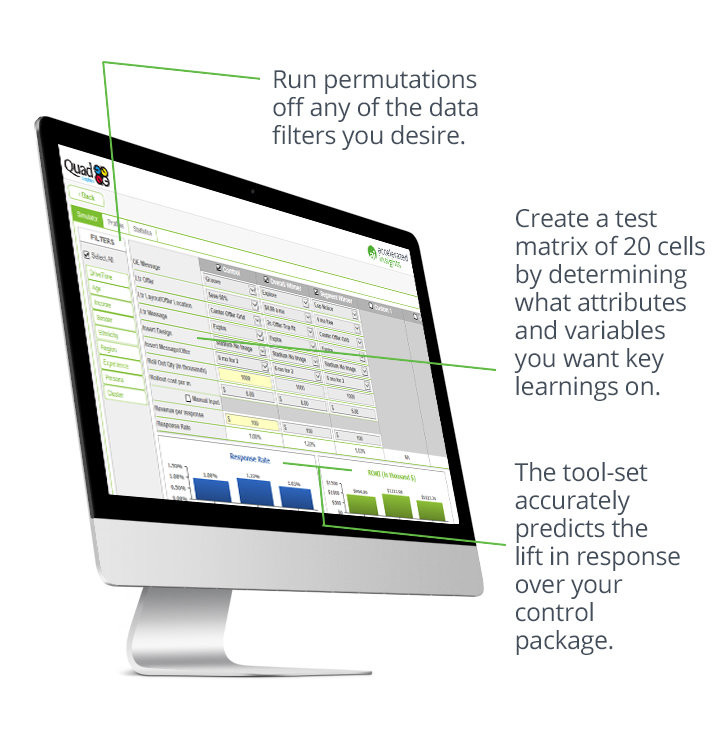 The Accelerated Insights Simulator is a cloud-based application that gives you secure access to testing results 24/7.